USA facing a ‘wealth bubble’? Americans are about as wealthy as they’ve ever been—and that’s a worry? Yup, say veteran economists Daniel Thornton and Joe Carson. They’re concerned that the swelling of wealth could prove unsustainable because it’s far outstripped the growth of the economy since the recession’s end in 2009. The economy of the USA is more fragile than many realize. 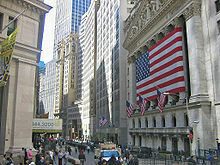 Housing prices and the stock market have benefited greatly from the low interest rates of the US Federal Reserve, as well as from the various ‘quantitative easing’ (legal counterfeiting) from the Federal Reserve as well as the increasing US government spending (with its increased accumulation of debt pledges). The USA has greatly loaded itself “with many pledges” (treasury bills and bonds). It has also diluted the value of its currency by producing it without real backing. Although the Bible warns against using dross and diluting the money supply, modern ‘experts’ have a different view. The wrong views on economics will lead to economic problems and ultimately the total crash of the dollar of the USA. There are disastrous changes that will come to the USA (Daniel 11:39; Habakkuk 2:6-8). Wealth will essentially be taken away from those who will remain in the USA after the start of the coming Great Tribulation (the same will essentially hold true for those in Canada, Great Britain, Australia, and New Zealand). Collapse of the Euro and Dollar? War in 2020?. Larry Edelson of Money and Markets described aspects of current economic difficulties and explained why he felt matters would get a lot worse. He said war, like World War III, could break out as early as 2020. What did he call the ‘granddaddy of all cycles”? Will matters go as he said? What does the Bible teach? Dr. Thiel provides biblical insights that secular sources often miss. This is a video. British are the Covenant People What do ‘British’ and ‘Britain’ mean in Hebrew? Are the descendants of the Anglo-Saxons people of the covenant? Does the British royal family connect to the throne of David? What does the Bible teach? What does history show us? Is there any DNA evidence related to British-Israelism? When did Christianity make it to the British Isles? Could Jeremiah have made it to the British Isles? What type of Christians made it to the British Isles? Did the last King of England believe in British Israelism? This is a video. This entry was posted on Friday, July 22nd, 2016 at 3:00 pm	and is filed under Prophecy.